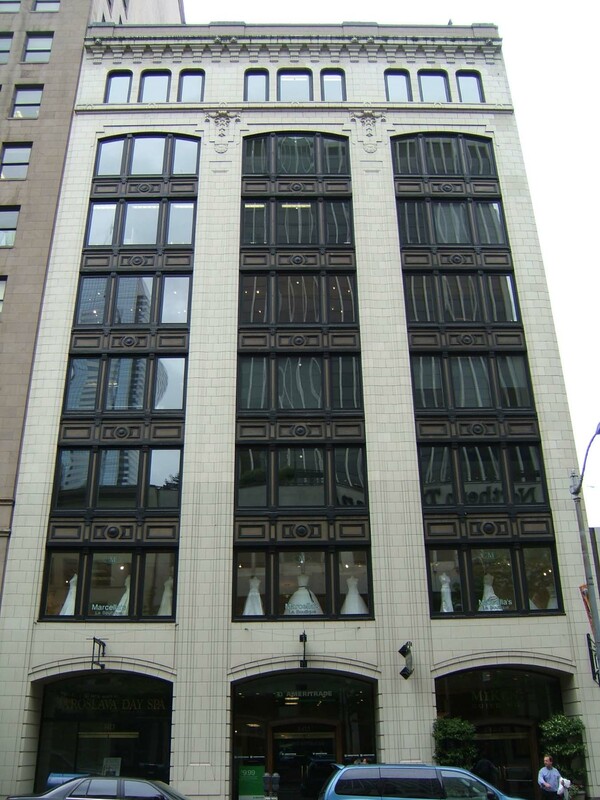 Located mid-block on the west side of Fourth Avenue between Union and Pike Streets, this eight-story office building was designed and constructed in two phases with the initial four floors built in 1918 and the upper four floors added in 1923. It continues to be used for commercial office and retail purposes. It measures 60’ x 111’ and exhibits an altered three-part vertical block façade composition and some intact terra cotta ornament. The reinforced concrete structure with concrete foundation and basement is clad with ivory-color glazed terra cotta. The façade is divided vertically between three prominent bays and horizontally between the base and shaft and cap. The vertical bays are accentuated by four wide terra cotta clad piers that extend to the seventh floor level where the two central piers are capped by ornate terra cotta tile sculpted in low relief and adorned with swags. Each bay of the shaft is dominated by tripartite window groups and terminated by segmental arched window openings. The bays are dramatically accentuated by dark cast iron (or glazed terra cotta) spandrels and mullions. The building cap at the eighth floor level is clad with terra cotta, distinguished by an intermediate cornice and dominated by sets of individual rounded-head window openings that align with the fenestrated shaft below. The terminal cornice is adorned with terra cotta lion’s heads and corbelled brackets. Original intact fixed or pivoting window sash appears to remain in place. The base is distinguished by broad two-story segmental arched storefront bays that were not part of the historic design and appear to have been constructed in the late 1960s. An historic photograph from the B. Dudley Stuart records indicates that the base was originally much more defined; it was clad with rusticated terra cotta panels and exhibited a distinct division between three rectangular storefront bays and sets of second floor level windows. An arched upper floor entry vestibule surmounted by ornate terra cotta was originally located at the north end of the northern storefront bay. The base is now accentuated by terra cotta clad piers that extend to the seventh floor level. Originally an intermediate cornice separated the base from the shaft and these piers were not continuous. The current storefront openings have been repeatedly remodeled and do not include any historic building fabric. There do not appear to be any intact or architecturally significant interior building features, finishes or public spaces.